This past Christmas, my daddy sent me a pair of new boots. It wasn’t the shoes as much as it was the symbolism in his gift. They told the story of how far we had come. As a little girl, I use to imagine what it would be like to have a father in my life. I used to pray and ask God to send him to me. In my mind, he would take me shopping and I would eat ice cream walking hand in hand with him. He would meet my boyfriend and admonish him before we went out on a date. I could talk to him about the unsettling confusing way of men and he would school me. All of these things were a part of the imagination of a little girl who wanted a “complete” family. I would be “daddy’s girl.” Unfortunately, that is not the father that was in my life. As a matter of fact, I didn’t know him. At 17, I set out on a journey to find him and as God would have it, I met him for a brief moment when I was 18. To me it was awkward. We exchanged numbers but it would be years before I heard from him again. Fast forward from 1998 to 2010, I decided that I would look for my dad one last time. I prayed about it and I told God that if I didn’t find him this time or he was unresponsive I would let it go. Besides, why did I have to do all of the work? I was his child so I griped, “He should be looking for me!” Through Facebook I found a cousin who got the ball rolling, although she gave me a word of caution about this journey…that maybe I should let it go. It sounded much like a letter I read in high school about my father where someone said that maybe I should “let sleeping dogs lie.” Was this person so bad that everyone felt the need to ring the alarm? It really didn’t matter what they said because I was prepared to give him a verbal lashing. Where have you been all of my life? Why this? Why that? When I received the package from him in the mail this Christmas, I was especially excited. In my thirty-one years of living, it was the FIRST thing that my dad ever bought me. I was excited and so was he. He bragged on his selection of shoes and talked on end about how he thought I would like them. Everyone knows that shoes are the way to a woman’s heart. 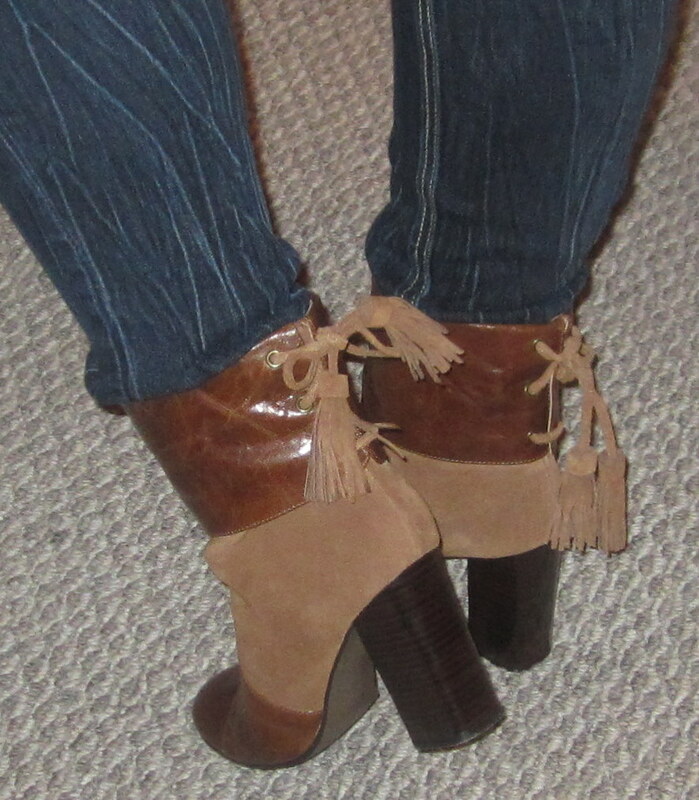 These boots fit perfectly and they were that perfect shade of brown. My calf muscles are huge so I can’t wear knee boots; he picked ones that came just above the ankle. His thoughtfulness came through. Our relationship is anything but ordinary; however, I am thankful that God answered the prayer of a little girl and worked in His perfect timing to bring this relationship to fruition. Thank You for making my concerns Your own. Continue to guide my heart and my mouth and let my words be pleasant even when my mind wants to spew venom. Give me wisdom so that I know which relationships are worthy of building and those that I need to let go. In all things, let Your perfect will be done in my life in Your perfect timing. In Jesus’ Name, Amen! Today I EMPOWER you to have a heart of forgiveness and remain stedfast in praying for a relationship that you want God to heal. Remove the preconceived notions from your mind and allow God to design something that is unique to your situation. He is a God that answers prayers.